The book of Philippians contains many wonderful truths. Here is a sampling from chapter 1. 1) Nothing ought to make us more thankful than when believers in Christ help each other in the work of the Gospel (1:5). 2) Not only the help we give, but the desire, the willingness, the propensity to give, is the work of God in and among us (1:6). 3) The basis of Christian community is love -- not our love but the "deep compassion that comes from Jesus Christ Himself" (1:8). 4) Our love for each other should "abound yet more and more" (1:9). I suspect that God has a very low estimation of those who feel no need to grow in love. Each of our relationships -- as spouses, as parents, as children, as brothers and sisters in Christ -- demands constant care and growth. 5) We are deceived if we think that we can live for anything but the Gospel and still be joyful (1:27). When Paul says, "The only thing that matters," he means it. Is the Gospel the one passion of our lives? 6) Be not afraid (1:28)! The Lord's people have no business wandering in the alleys of fear and intimidation. Let us register no excitement over the passing trials that stir this poor jittery world into a frenzy. The times may be perilous but they are in His hands. 7) The Christian life is a battle (1:30). If you haven't learned this lesson yet, cheer up: you soon will. Truly, to live for Christ (1:21) will cost us dearly. Individually we run into our share of storms, and collectively the true church is battered on every side. Tribulation is a reality but we can rejoice because He has overcome the world and all it can throw at us. 8) Are you willing to work with others? Paul says we must "struggle together," having "one common purpose" (1:27). The tragedy of our times is that we are not willing to cooperate with other believers because they are not like us. We spend millions promoting "our" denominations and programs and care little for helping others to accomplish the same goals. There will be no global evangelization until we repent of our self-centeredness. 9) I need not suspect the motives of others. If they are preaching the true Gospel, even in ways I think are unacceptable, I can still rejoice (1:15-18). A man once said to a famous evangelist, "I don't like your method of evangelism." The evangelist asked him, "Well, what's your method?" The man answered, "I don't have one." "I like mine better" was the evangelist's wise reply. How the old nature wants to take off after every distraction that crosses our path! Paul says, "The Gospel is being preached, and in this I rejoice." 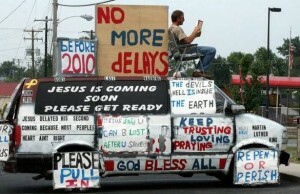 Who are we to say that people will not come to Christ when they see a truck like this one? 10) Please let's honor and esteem our leaders but never exalt them above others in the church. Overseers and deacons are extensions of the Body, not over it (1:1). One of the great tragedies in the story of Christianity has been the shift in understanding that has taken place concerning our view of church leadership. "Overseers and deacons" are not proud titles but descriptions or activities: "those who oversee and serve [the congregation in some special capacity]." Our Lord anticipated our trouble when He set the record straight (Mark 10:44-45): "If one of you wants to be first, he must be slave of all. For even the Son of Man did not come to be served; He came to serve and to give His life as a ransom for many." 11) Righteousness comes only through Christ (1:9). Only He can make us right with God and with others. Churches and homes are rent with strife and sin because members do not get right with God through confession and by claiming the cleansing blood of Christ (1 John 1:9). 12) What are the "chains" in your life? God can use them for His glory and for the expansion of His kingdom. He did that with Paul's chains (1:12). God often grants His servants their greatest success in their weakest moments. The early church was powerless yet it met everything as it arose and evil gave way before it. The problem of a broken home, for example, can be transformed into a mighty visitation of God. The best rule for Christian and church is this: "My grace is all you need, because my power is greatest when you are weak" (2 Cor. 12:9). There you have it -- a few "lasting lessons" from Philippians chapter 1.